Trevor Hailey, 66 - Joe.My.God. Sad news. Famed Castro tour guide Trevor Hailey died unexpectedly in San Diego last week. When I lived in San Francisco, Hailey was a familiar sight around the gayborhood as she led enthusiastic visitors on her “Cruisin’ The Castro” tours. More than a couple of times, I happened to be on the sidewalk behind Hailey’s group, eavesdropping as she regaled wide-eyed homos with fascinating tales of Harvey Milk, the White Night riots, and the landmarks of Gay Mecca. Hailey retired with her partner to San Diego in 2005. 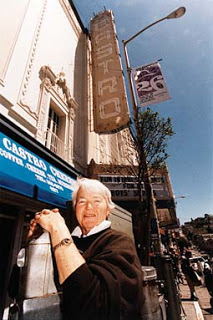 Despite her sudden death, the documentary Only In The Castro With Trevor Hailey played its scheduled run in last weekend’s Frameline LGBT Film Festival.